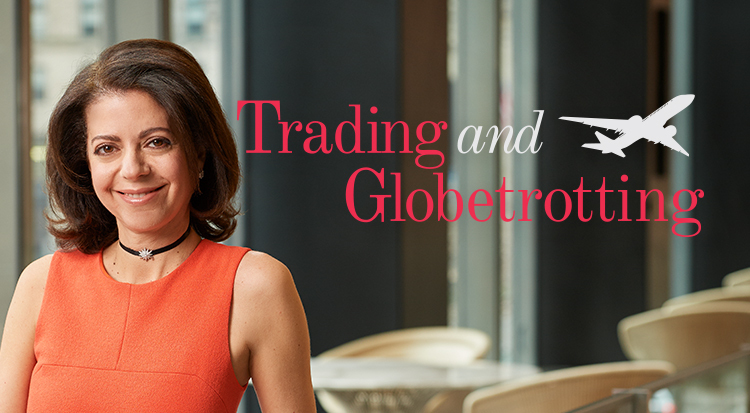 Claudia Jury, BSIM ’88, returned to her hometown of New York City after she graduated and rose through the ranks at one of the world’s most influential investment banks. Claudia Jury started her career on Wall Street as the only woman and only undergraduate in an elite training program at a major bank. Today she is co-head of a multi-billion-dollar global business with more than 200 employees in 24 countries. Along the way, she developed a leadership style defined by collaboration and leading by example. I grew up in New York and was fairly certain that I would end up back in the city after school, but I graduated in 1988, when most people weren’t certain there would be a job waiting for them when they finished college. So I felt fortunate to land a spot in the markets training program at Manufacturers Hanover Trust. At the time, Wall Street firms were focused on hiring MBA students, and I don’t think anyone will be shocked to hear that they were mostly male. When I showed up that first day, there was so much to be intimidated by — and excited about — that I never focused on the fact that I was the only undergraduate and the only woman in the class. The program was small, so we had to be close and work together. After three months of training, I became a junior analyst — basically an apprentice — on the Foreign Exchange desk. You spend that first year asking lots of questions, learning the business and figuring out how to add value to the team. As it turned out, that was the last time I looked for a job. Manny Hanny (as the firm was familiarly called) was acquired by Chemical Bank in 1991. Chemical subsequently acquired Chase Manhattan Bank in 1996. That organization merged with J.P. Morgan in 2000 and ultimately became the firm we know today. J.P. Morgan is the legacy of more than 1,200 predecessor institutions, and I am proud to be the caretaker of a small part of that heritage. I was a Japan specialist and traded yen for much of my career. By demonstrating my expertise and showing that I could be thoughtful about the organization, I earned the opportunity to manage a team in New York and later a global team. It showed me that I could — and wanted to — expand my experience from an individual contributor and desk head managing people to deciding the strategic direction the business would take. In 2014, as part of a larger organizational change, I was named co-head of Currencies and Emerging Markets. My co-head in London and I oversee 200 professionals in 24 countries in nearly every part of the globe. Overnight my responsibilities expanded well beyond my expertise. The requirements for operating this business were staggering to me; from local regulations to the macro economic and political environments, many incredibly idiosyncratic matters make trading tricky in these markets. My learning curve was almost vertical, and early on I needed to establish credibility among a group of individuals who had far more expertise in their areas than I did. I had to ask questions they might have been surprised I didn’t already have the answers to. It was a lesson in resiliency — similar to when I first joined the firm. I reminded myself that I was in a leadership position because I had demonstrated my expertise, an ability to think strategically and to have impact. Two things define my leadership style — and show the influence of having gone to the Tepper School: collaborating and leading by example. When we put the business together in 2014, my co-head was living in Hong Kong, and I was in New York. Besides the 12 hours and 8,000 miles that separated us, we had different backgrounds and communication styles. But our goals were (and still are) the same, and we’re deliberate about making sure our messaging is aligned. Co-heads don’t always work out over the long term, but it has been three years now. The fact that our business is a market leader speaks to how effective our partnership has been. We are proud of the work we have done together, and we are looking forward to doing so much more. Collaboration doesn’t stop there. I also work closely with the electronic trading team, which delivers our product digitally, with the same quality and controls but faster for clients who need that, and the sales team, which makes sure our clients get the best of all the firm offers. Leading by example is about being prepared to do whatever I ask the team to do. My morning starts at 5:30. I’m one of the first in, and I stay until well after the trading day is over. Our business is sensitive to geopolitical events, so we can succeed only if we show up when they are happening, no matter where they’re happening. During the U.S. presidential election, it was all hands on deck with our trading desks around the globe staffed through the night. Our traders have to be willing to be there, and I am prepared to sit side by side with them. My goal is to create an environment where people feel included and comfortable challenging assumptions. I also look for opportunities for the team to build their skills and networks, so they can grow intellectually and progress in their careers. There is so much talent on Wall Street, and now we need to get more women into some of those seats. We’ve had great success in equalizing the number of entry-level male and female candidates, but retaining women continues to be a challenge across the industry. One way to try to change that is through diversity networks. I’m on the advisory board of J.P. Morgan’s Corporate & Investment Bank Women’s Network, where we create opportunities for women to expand their networks and their toolkits. The network focuses on providing women in executive director and managing director roles with opportunities for development, sponsorship and mobility. We host technical skills workshops where participants can broaden their knowledge of markets that they may not be active in every day and develop their skills for communicating and interacting with clients and senior managers. Engaging with this group is one of the most rewarding parts of my job because I get to help them refine their skills so they are ready when an opportunity presents itself. The goal is to foster a community for these women to engage with and empower one another. In high school, I was interested in art history and loved visiting museums and traveling. My father and I had agreed that I should look for something with more career potential, though, and I was interested in studying business or economics. When I visited Carnegie Mellon, I saw how quantitative the business program was, and I loved the intersection among programs on art, business and technology. Carnegie Mellon had an appreciation for what technology could do for a business and how that would become critical to what we do today. Even in the 1980s, we were building robots on campus and learning how computers could do things human beings were doing. Fast forward 30 years, and you see J.P. Morgan and our peers building algorithms that simulate the trading activity of a human, but faster and with fewer errors. These algorithms help our clients access liquidity across many different markets, and they help us at J.P. Morgan grow and scale our business. For example, during the British vote to exit the European Union, our systems allowed us to transact at a rate in excess of 1,000 foreign exchange trades per second, a rate at which no human could perform. Technology has been transformative for our business and for our clients. The bottom line is that you need to pursue something you absolutely love. So ask yourself, am I truly passionate about markets? Am I prepared to eat, sleep and breathe them? If so, get experience looking at markets by participating in the investment club and develop an opinion about what’s happening. Learn to articulate your opinion with confidence. You should also be able to multitask, be attentive to detail and be resilient. We hire entry-level employees from a variety of backgrounds, but even a history major should take quantitative classes so he or she can hit the ground running. Historically Carnegie Mellon wasn’t a core school for J.P. Morgan recruiting, but that’s changed. We realize that the university is a unique place where students can access one of the oldest drama schools in the nation as well as top engineering and applied science programs. It’s a place that has understood for a long time that infusing any activity with technology is how you are able to do that activity better. For years students have graduated with degrees in graphic design or international relations or industrial management and have also had the strong quantitative skill set they need to excel in whatever field they choose. In the past, a place like J.P. Morgan would have lost students to engineering, but we are making the case that they should consider trading.